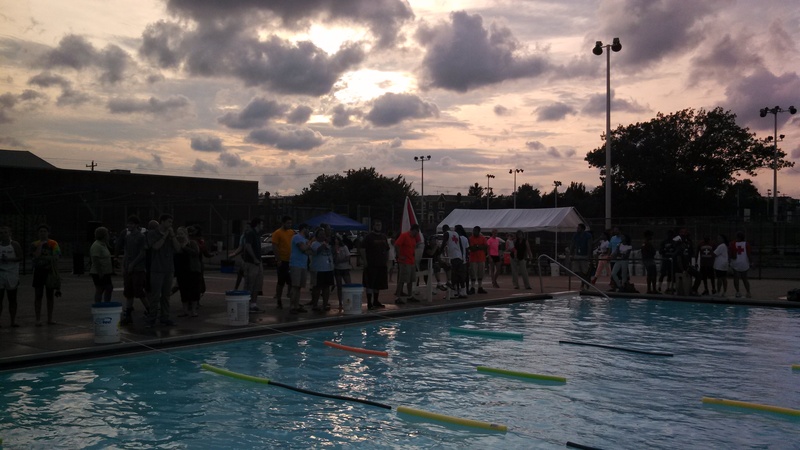 Lifeguard swim meet at Vogt Pool, August 8th, 2013. Even better than my summer as a lifeguard was the training I needed to do to get there. It was satisfying to learn how to do CPR and how to get an injured person out of the water safely. And I was impressed with the maturity and seriousness of my fellow trainees, most of whom were (no exaggeration) half my age. But what really made the training was the lead trainer, an absolutely fascinating Philadelphia character named Larry Brown. Larry conducted most of the twice-weekly, three-hour trainings in a shout, which echoed off the walls of the Sayre-Morris Rec Pool, alternately sounding like an army drill sergeant and a beleaguered uncle. For religious reasons, he swam fully clothed. Long sleeves. Long pants. Boots. And – fully clothed, not to mention being, at this point in his life, a grandfather – he could swim the entire length of the pool underwater without coming up for air. Larry has been a Water Safety and Lifeguard Instructor in Philly for over twenty years. As such, he not only trains incoming lifeguards but during the summer pool season travels around inspecting safety and operations at pools across the city. He knows every neighborhood in the city – what they’re like now, and what they used to be – because he knows every pool and a sizable number of the people who staff them. I loved talking to him and Thelma, the other WSI running the training – hearing their perspectives on Philly’s people, places, and of course pools. And beyond the shouting (from Larry) and the lectures (Thelma’s specialty), the two of them really bent over backwards to make sure we all got trained right. I’m not sure how many one-on-one make-up sessions they had to do for classes we missed, whether for work trips (me) or senior proms (everybody else), but there were a lot. A few weeks into lifeguarding at O’Connor, I decided that I too wanted to know all our city pools. My plan was to swim in all 70. I made it to 33, and swam in even fewer (some were drained, or draining; one was filling back up after an accidental draining). Next summer I’ll start earlier. In the meantime, I don’t want to stop exploring the pools. And so, given that it’s off season, I’ll be doing that here. I really love this blog, and the whole idea of exploring the public pools. I learned a lot. Thank you!